Well after much consideration I finally figured out what project I wanted to do with that Raspberry Pi. I had done a ton of research on different fun little projects. The one that stood out was not exactly the most original project, but one, I absolutely had to have in my possession after seeing it. It was called the Pi Cart. Basically what I would be doing is creating an emulator which is a computer program that creates an environment for games to run in. Inside of that environment I will be able to load ROMs which are the games themselves. 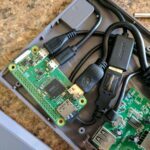 I would mount that program in the Raspberry Pi which would be mounted inside of an Old Nintendo Game…The Pi Cart. Getting started with this project was incredibly easy. First thing I needed was an old Nintendo cartridge luckily they are everywhere. 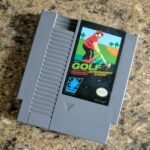 I found a Nintendo Golf cartridge over at Mojo’s in Antigo which had it for $2.99 a price I considered to be incredibly Fair. The reason I chose this game was because of the awesome retro 8-bit graphics the cover. I actually had never played this game when it was originally out so I was very excited to actually give it a try! Nintendo in an effort to curb people opening their cartridges put special screws in there games. Thankfully I’ve opened up enough of these cartridges so I happen to have this particular driver on hand. After opening up the cartridge and removing the game circuit board I started a few cosmetic changes to the inside of the case. There’s a thin plastic Channel that runs along the inside of the cartridge to help hold the card in place. 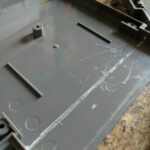 This piece of plastic needs to go in order to have my connectors installed. 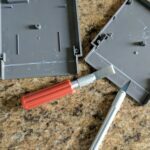 So I grabbed my trusty X-ACTO knife and began patiently cutting away the plastic that was in my way. After a few minutes of meticulous trimming I was able to finally create a space that was needed for my first part to be installed. Step 2. Lets Put Some Stuff In! Parts & Supplies need for the Second part. 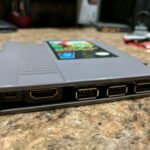 The first part that needs to be installed inside of this cartridge is a USB hub. Unfortunately the Raspberry Pi ZW only comes with one and there was definitely a need for additional so I went on Amazon picked up a generic 4 Port USB hub. 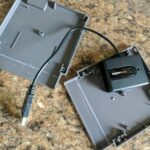 The USB port is incredibly easy to open, just simply push a screwdriver into the side and it will crack apart leaving you with the board and USB cord. It is almost unbelievable how easily this board will fit in the location you see in the picture. It’s almost like it was meant to be there. 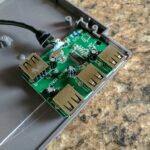 Of course the next job is to find a place to mount the Raspberry Pi there are a few locations that work well however I found that if you mounted to near the top you will be able to make a small notch in the side of your cartridge and have access your SD card. That’s important if you ever wish to upgrade or change the content of this particular project. Parts & Supplies need for the Third part. After many adjustments on wires and needing to cut a few more pieces of plastic out of the inside, I finally settled on the location. I then trimmed out a small notch to allow me that access to the SD card and then I used some very strong epoxy to mount some screws to the bottom of the case to hold the Raspberry Pi in place. I use that same epoxy to mount the HDMI power and USB cords. Then I needed to wait 24 hours for everything to harden up. By the way waiting for epoxy to harden is one of the most painful things I had to do for this entire project. Parts & Supplies need for the Fourth part. 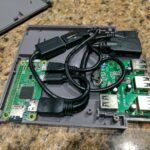 Now that everything had set, it was ready I was able to close the case back up and test out my brand new Raspberry Pi cart. Now what I failed to mention earlier was the fact that during that 24 hours of waiting for the epoxy to set I spent a little time creating the image file I would need for my project. I hunted down what I considered to be the best operating system for such a project. 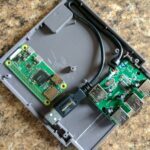 What I settled on was one called Retropie it is an incredibly well-written piece of software that allows you to load up many different style emulators. In this case, the one that was important was the original NES emulator. 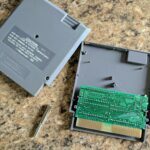 After setting up the software which was time-consuming but not incredibly difficult, and loading up the ROMs I was finally ready to mount the card inside of the project. Parts & Supplies need for the Fifth part. Hooking up the wires was a straightforward as you would imagine. Power goes to Power. HDMI goes to the HDMI. The USB was slated for my controller. 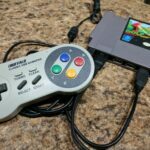 I chose to use the Super Nintendo clone made by iBuffalo. Within just a few seconds I was greeted with my emulators main screen. 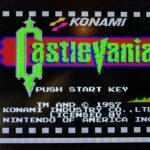 I chose the ROM I wished to play in this case it was Castlevania, and crossed my fingers and waited patiently for a few seconds as my childhood came flying back! This project was an incredible amount of fun and is definitely something I would highly recommend anyone with a little technological skill. This was not a difficult project, but it is one that will require a few tools, a couple dollars in parts, and most importantly some free time with a willingness to read directions. If you ever stop over at my office please ask me I will happily show you this project!